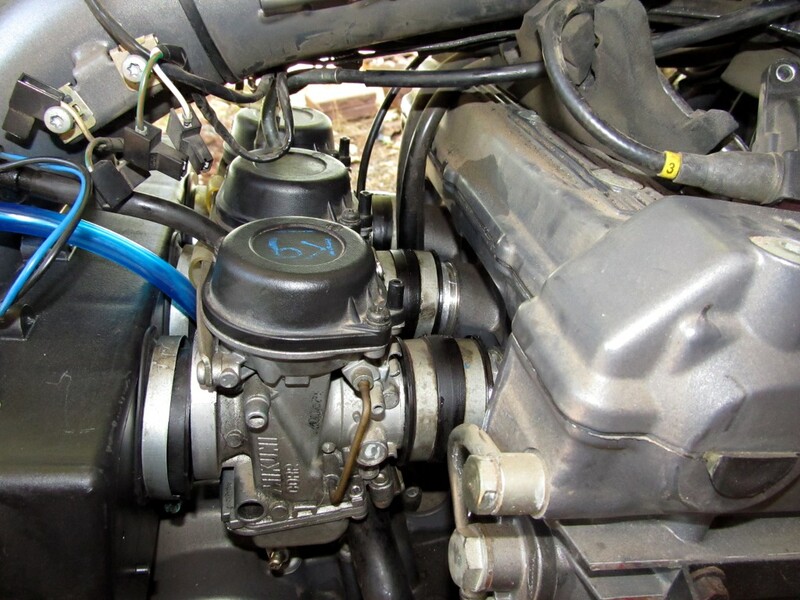 I began the tasks associated with fixing the problem(s), and ended up deciding that what she really deserved was a complete refurb of the fuel and vacuum systems, to include new fuel and vacuum lines, a new petcock, and a rebuild of the carburetors with all-new seals and o-rings. So I ordered the parts …. If you’ve been following me here, you know I’ve gone through a few different bikes and done a lot of riding lately. That has meant that I haven’t done much wrenching. None, in fact. 🙂 So now, with the Speed Triple on its way from the other end of the country, I decided I needed to get Kat out of the shed and put her on the parking platform next to Simba so I could work on her ‘out in the fresh air’. That shed is a bit claustrophobic, and gets really warm inside during the day. Yes, an excuse; but hey, I can do that too. So here she is parked next to Simba this evening, ready for me to dive in tomorrow morning. Might take a week or two to finish everything up; but that’s okay. She’ll be ready to rock. Got started on the project today. Cleaned things up so dirt doesn’t find it’s way into the innards of that sweet triple, then pulled the intake snorkels, the battery box, and moved the ignition coils out of the way so I could see the next steps clearly. 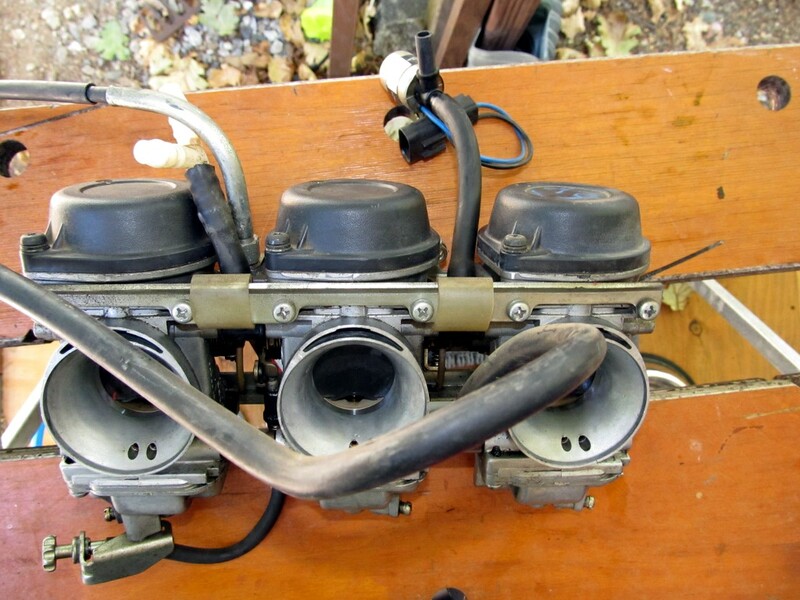 I’m thinking I should setup the Hero2 to capture some video as I deconstruct the complicated vacuum plumbing before I pull the airbox and carbs…. Couple of pics after pulling the battery and battery box, moving the coils out of the way, and preparing for the vacuum system rebuild. I decided to do that before pulling the carbs, just because it makes sense to me that way. 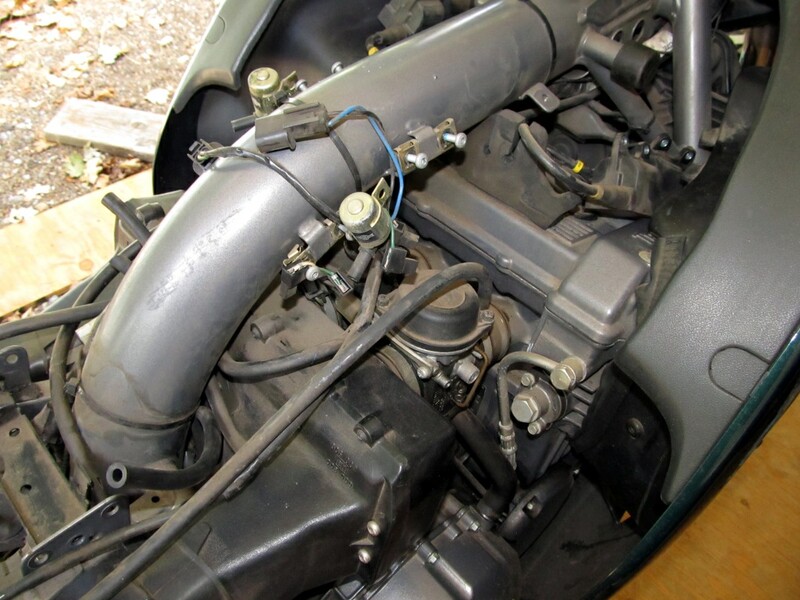 Battery box and coils out of the way, lots of vacuum hoses there! A little closer in. You can actually see the carbs now! So I’ve been reading up, soaking up the knowledge of others who have been through this before. I was thinking perhaps I could do this job without pulling the fairing off, as the experts declared I must. Well.. they were right, as it turns out. So today’s task was to remove the fairing panels so I could get to the screws on the intake manifold clamps. … and now you can actually SEE those screws! As you may have noticed, I am progressing VERY slowly, and that is the way I prefer to work on projects like this. One step at a time. Take a step, then bond with the machine and the new bits that have been revealed before taking the next step. 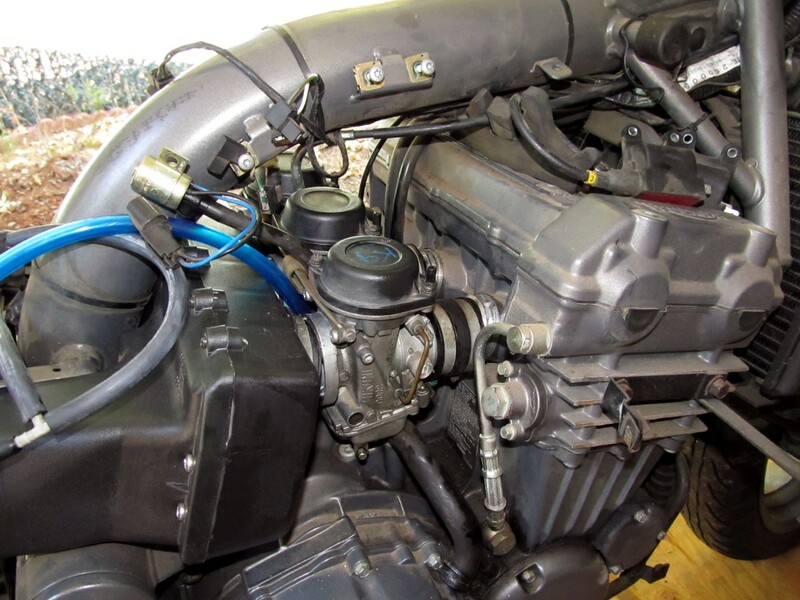 After a busy Sunday and Monday I got back into the project, disconnecting throttle and choke cables, breather and vacuum hoses, and loosening up the boot screws. 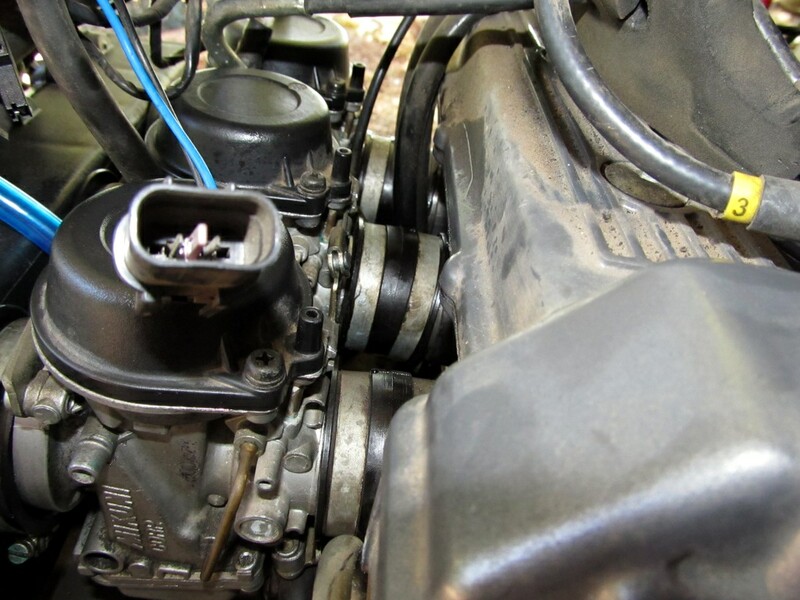 The excellent instructions (from the web) suggested the next step would be to ‘move the airbox back as far as it will go’, followed by wiggling and tugging the carburetor rack to pull them off of the intake manifolds. Well… not as easy as it sounds. 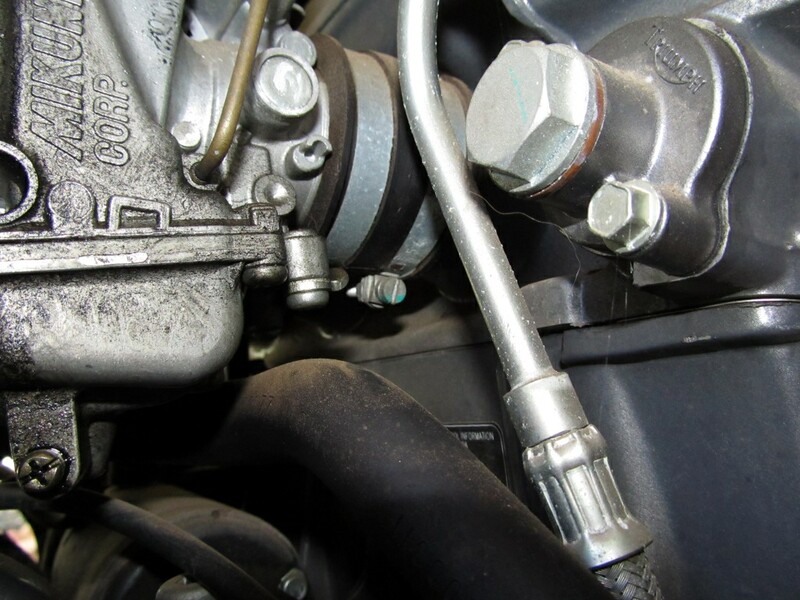 🙂 There are many hoses in the vacuum and emissions systems that will have to be removed before the airbox can be moved more than about 1/4″. 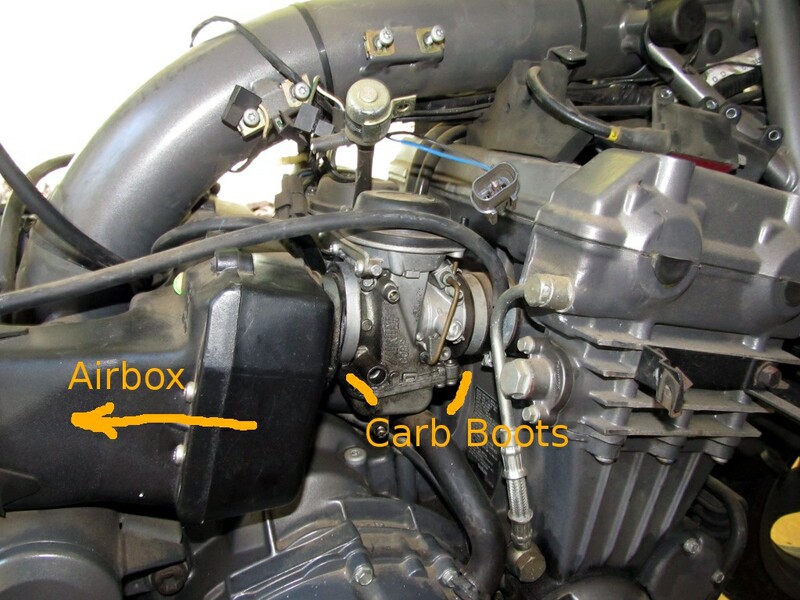 Boots loosened, cables disconnected; but how does the airbox move? 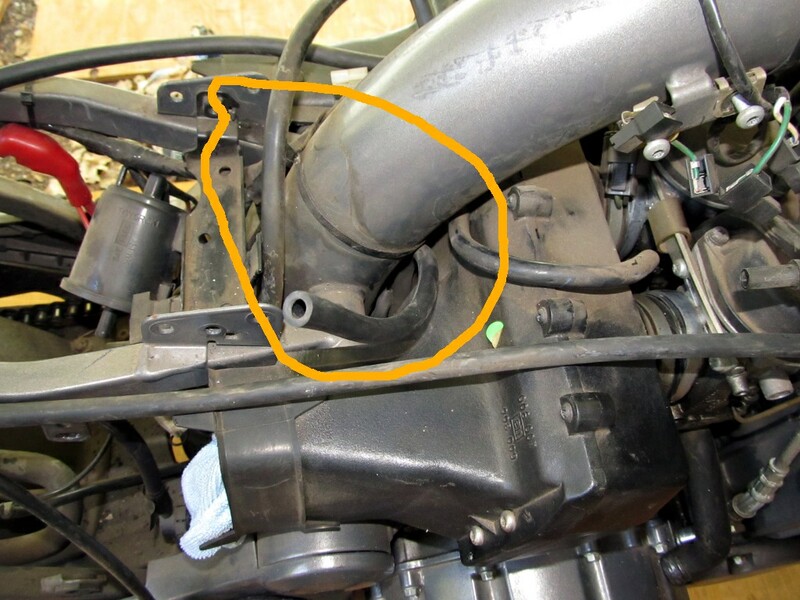 The hoses in the indicated area must be removed, that’s how! If you didn’t know this was there, you’d have a problem! It’s under the carbs, in the middle! 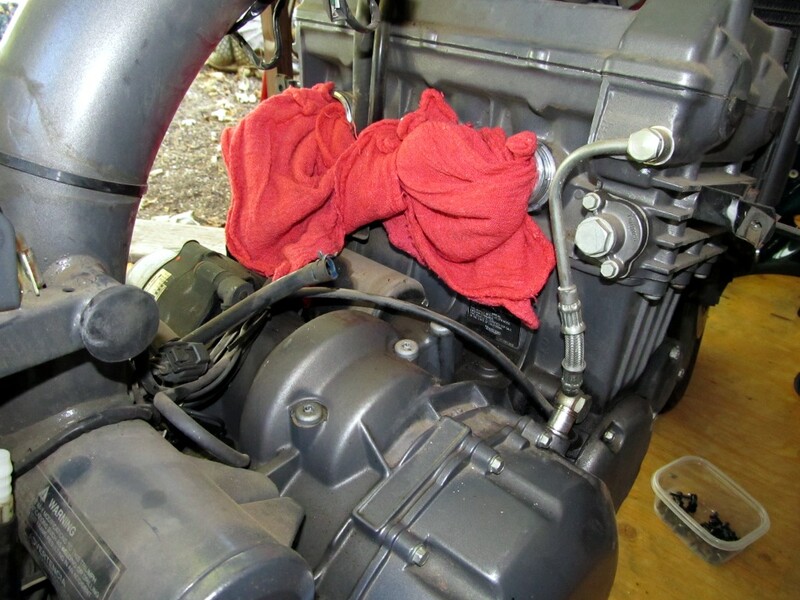 So, after disconnecting the vent hose and removing the vacuum hoses that were in the way, I went to work on the carburetors themselves. And…. SUCCESS! 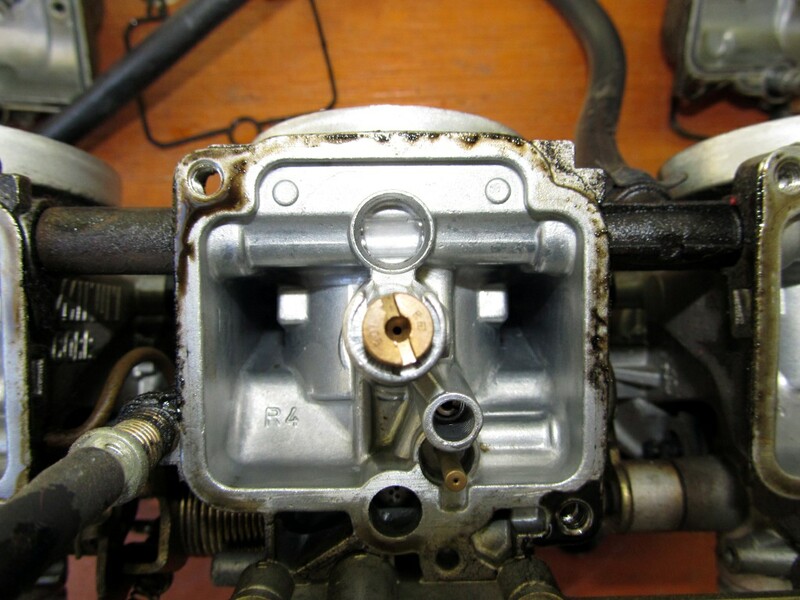 A sizeable emptiness where the carbs and airbox were once in residence! 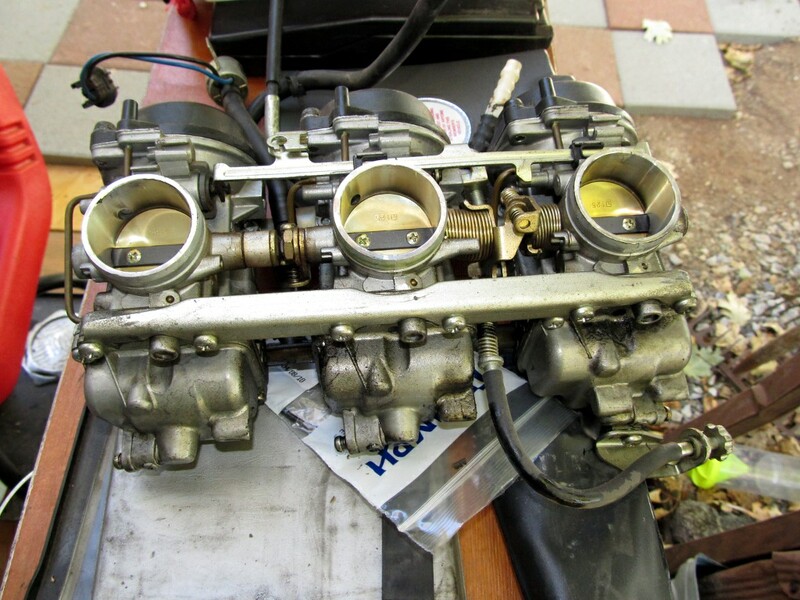 The carb rack, ready to tackle next. I’m expecting much grunge inside these babies. 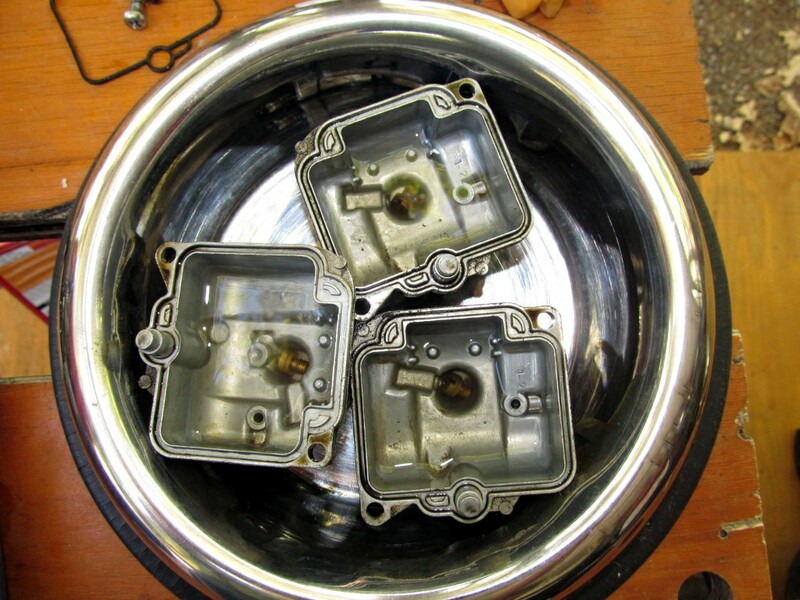 Surprisingly little varnish buildup in these carbs. Chevron with Techron! While cleaning out the float needle on #2 (above), I found quite a bit of ‘particulate matter’ – evidence that this indeed was the culprit. #1 and #3 were clean. I had some extra time, and decided to make use of it by going through the vacuum hoses on the bike. Lots of cracking at the fittings, and nearly all had to be replaced. Some of the new tubing is a lovely blue. Looks like spaghetti. Hope I can get it all back together! Okay, so after a few days of taking care of other bike stuff and taking delivery of Mantissa (‘Coming Soon’ and ‘Marvelous Mantissa’) I got back to work on Katrina. 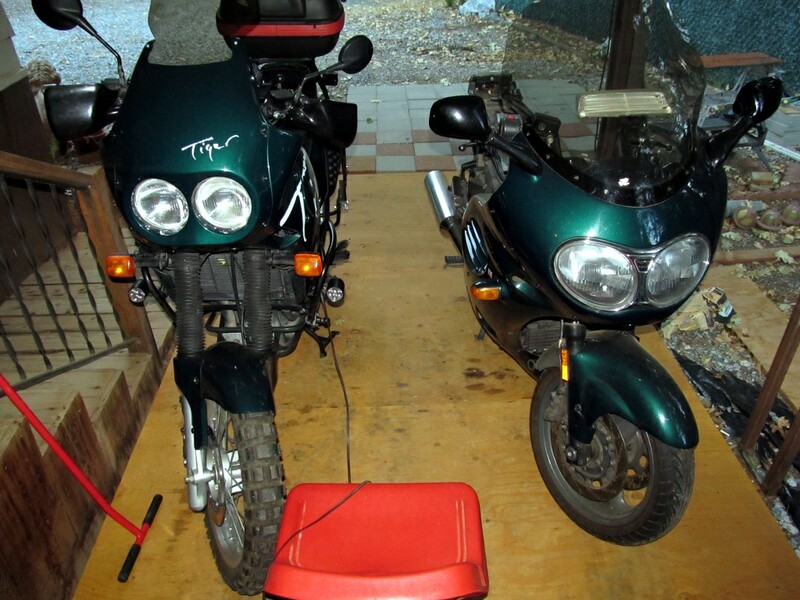 There were a couple of items I needed to replace while I had the fairing off, so I installed the new Xenon headlight bulbs and the new speedometer cable so as not to forget to do those things. 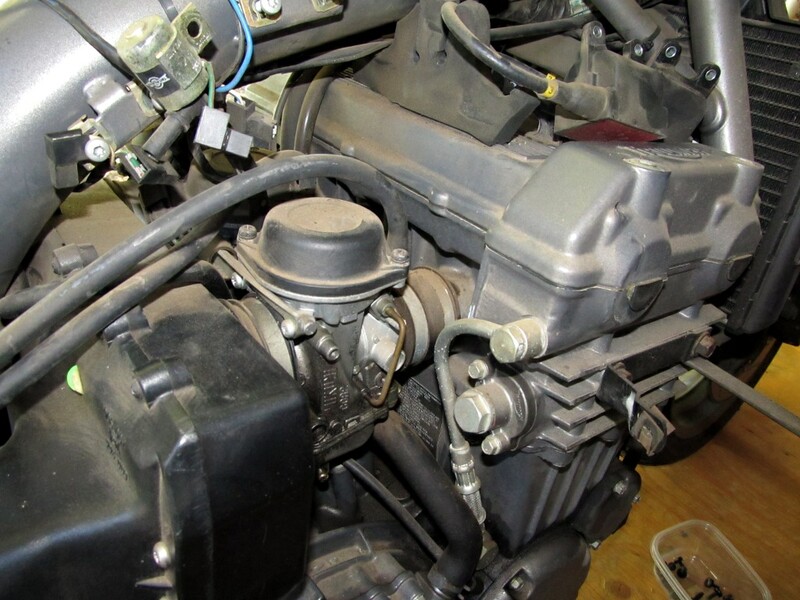 Then I got serious, mounting new boots on the new airbox/filter, fitting the crankcase breather hose to the new airbox, and fitting new fuel land vacuum lines to the carb rack. 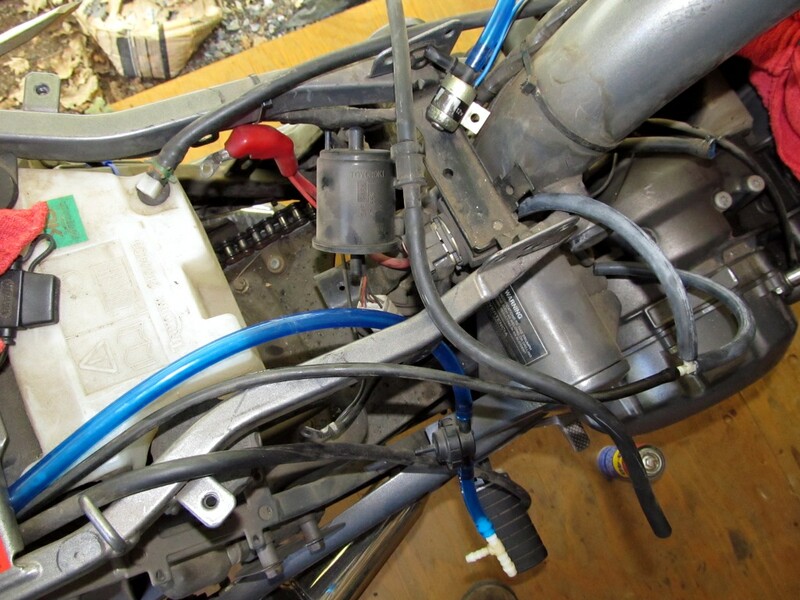 Then the airbox was put in place, routing a few vacuum lines so they would go back where they were before disassembly. 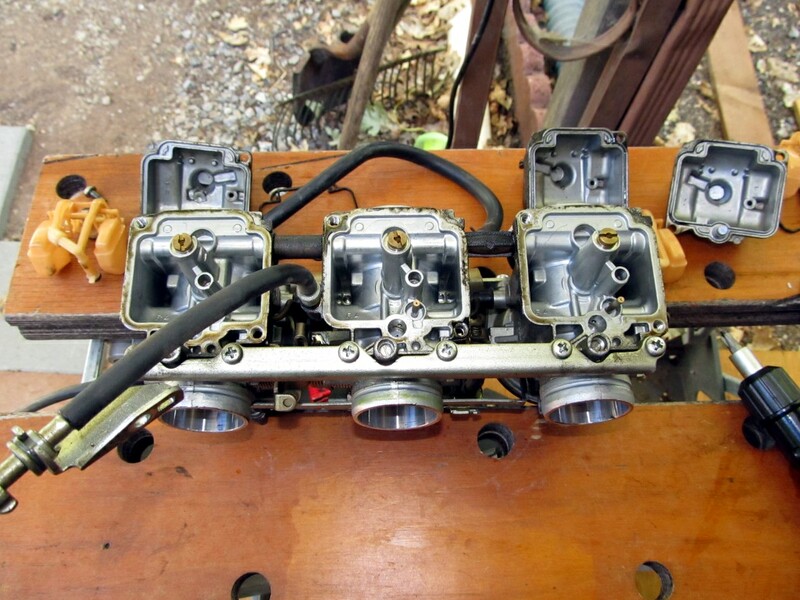 A bit of petroleum jelly was used on the carbs and the intake manifolds to allow the boots to slide on easily (well, as easily as can be expected). 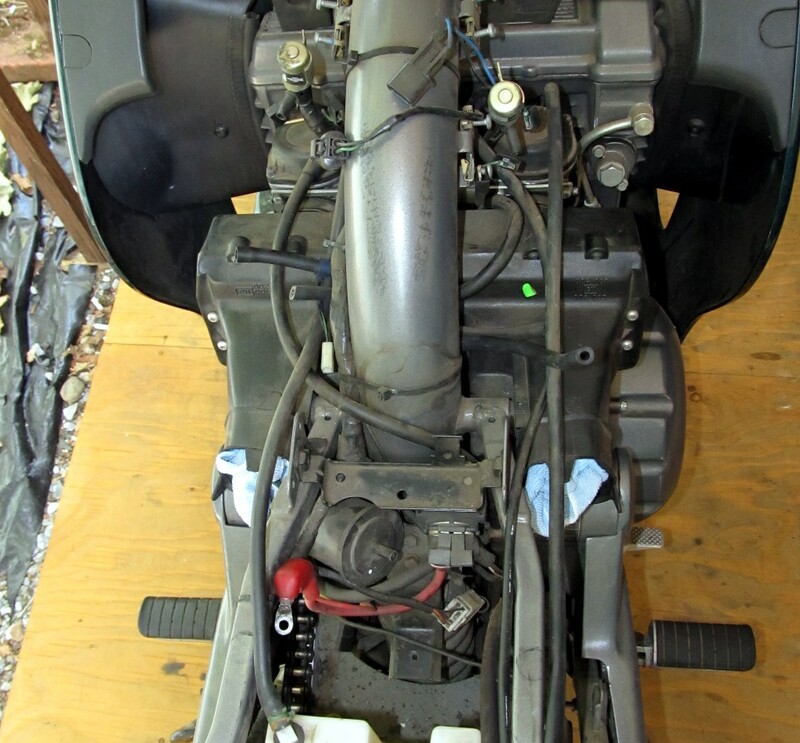 Then I began the somewhat tedious process of routing the throttle cable along the frame, under brackets, through small spaces, and up to the handlebar. It’s a tight fit in a couple places, and there are large bundles of wiring you need to navigate around without messing up the harness. 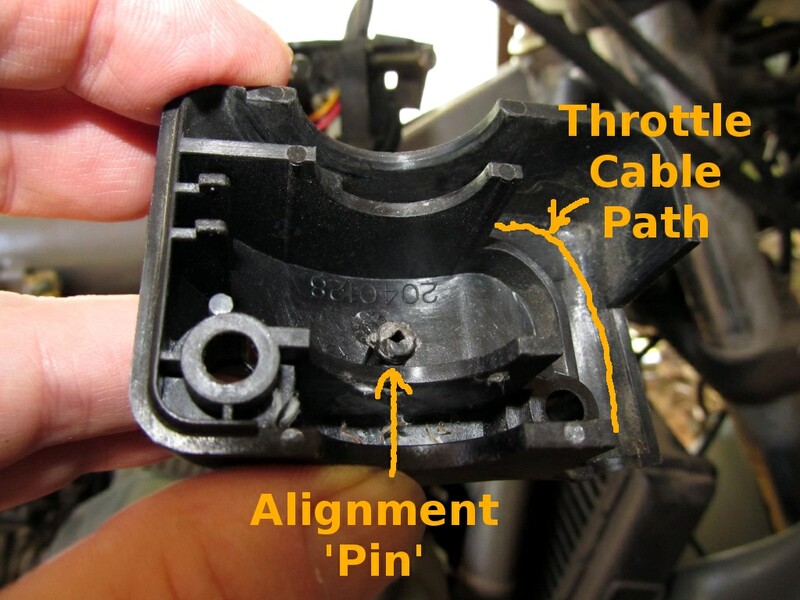 Then the choke cable should be connected and checked. It’s a pretty simple procedure. 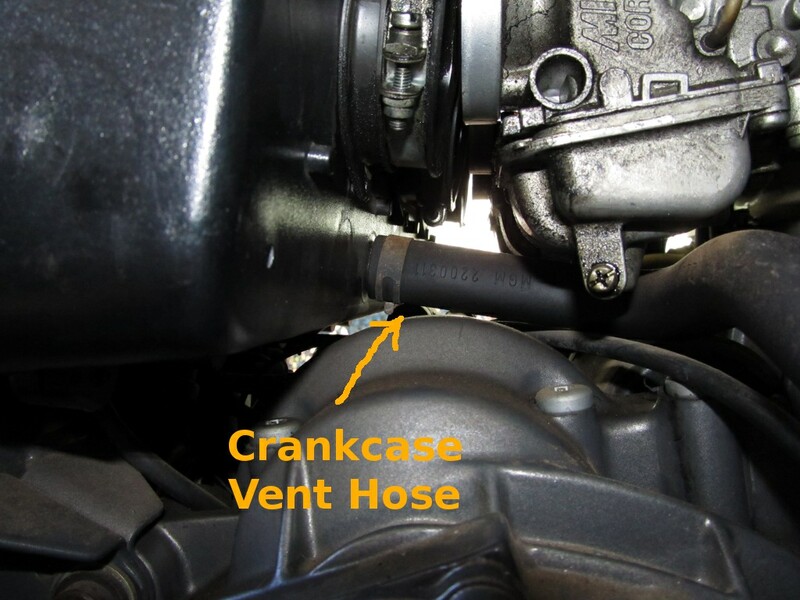 Oh yeah, don’t forget that crankcase breather hose! 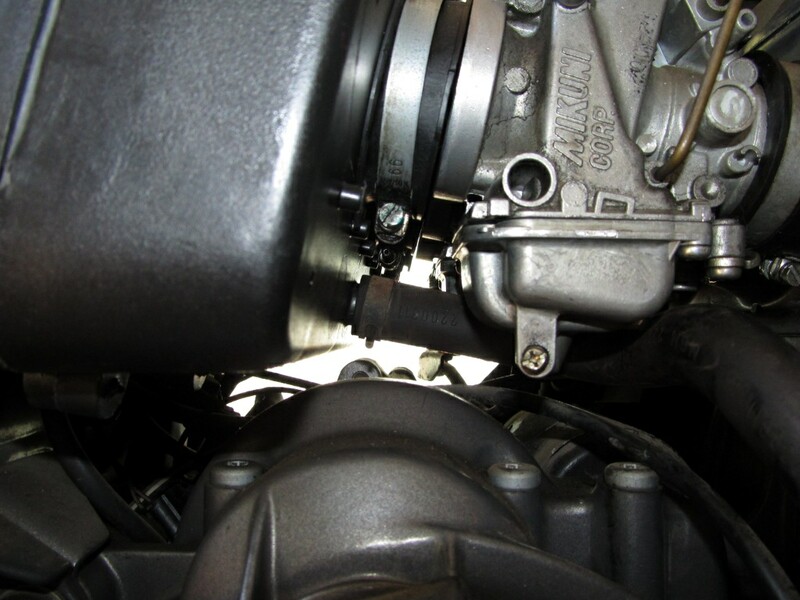 The hidden crankcase breather needs to be fitted! It’s a puzzle I tell ya! 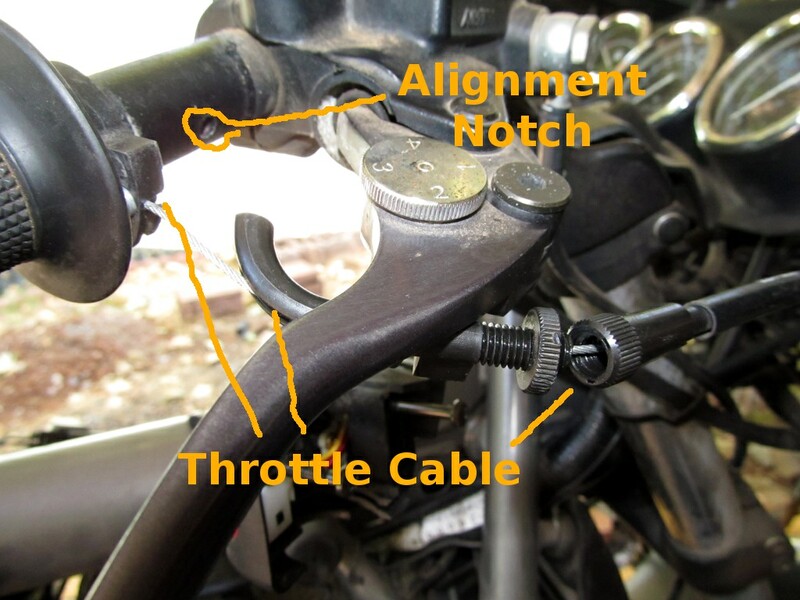 That alignment notch (actually a small hole in the handlebar) is critical to getting assembly back together! 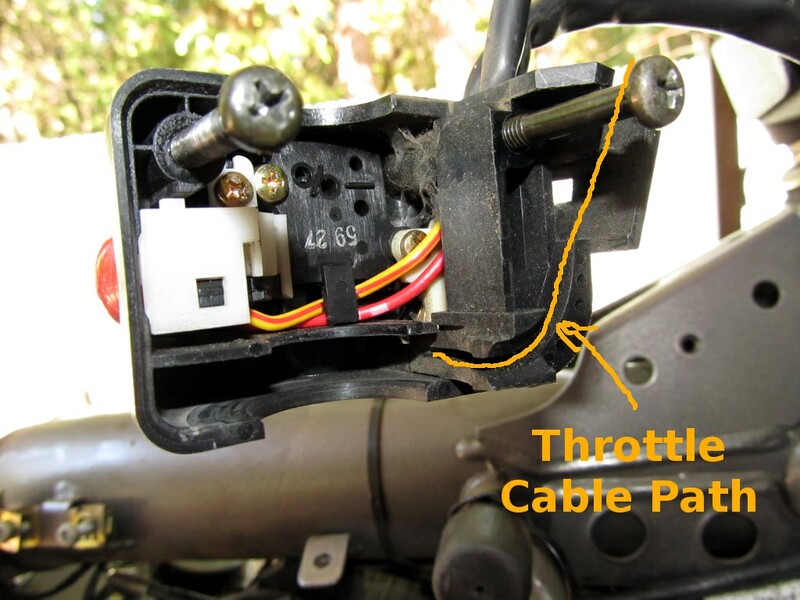 You have to get the throttle cable positioned such that when you set the switchgear ‘half’ in place, it lines up with that notch. Otherwise things won’t fit. Stay tuned for Kat’s resurrection! 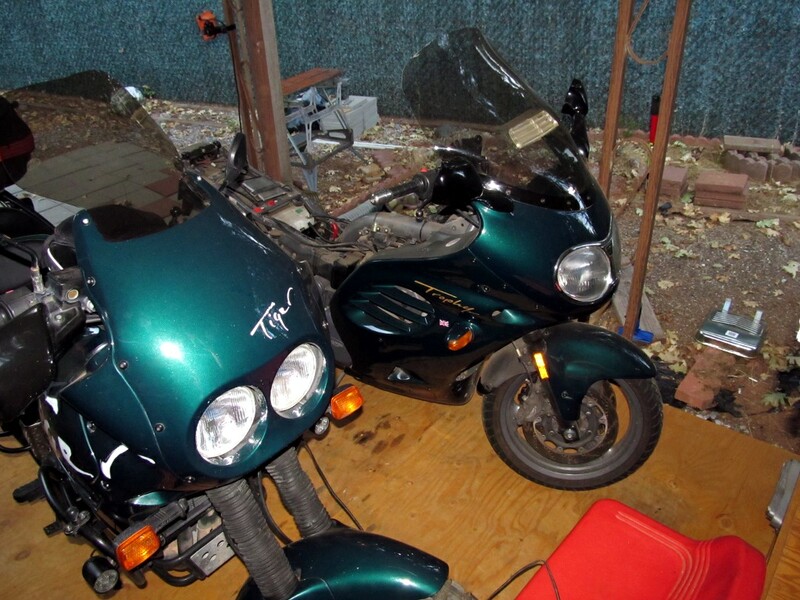 It’s great to hear that a) I’m not the only one with a fondness for this colour, and b) I’m not the only one who names their bikes…what a lovely pair! Thanks Andrew, already got that covered. 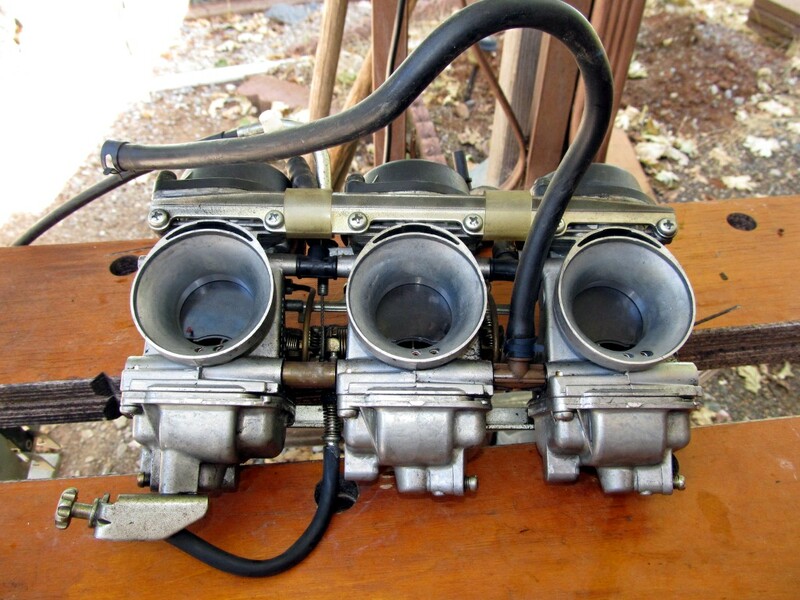 Fresh o-rings at all locations in the carbs, and new fuel hoses as well.